Tiny homes, or micro homes, are rising in popularity as more people are focusing on sustainable ways of living – both sustainable for the environment and sustainable for their pocketbooks so they can achieve some level of financial independence without having to spend the majority of their time at work. Tiny homes can be anywhere from 100 to 900 square feet, and they can cost as little as $10,000 if you use recycled materials and do the work yourself. They also consume fewer resources, and they are on wheels, so they can move with you. The challenge of a tiny home is that it is – well, tiny. Interior décor has to make use of every bit of the space. Using space saving furniture like storage beds is an ideal way to make the space comfortable without having to sacrifice what you need. If you live alone or with a romantic partner, there is nothing that says you have to have privacy for your bedroom. No one is going to walk in on your space in the middle of the night. Therefore, you can make a single room work as your living room and your bedroom. Use a wall bed that you can fold down at night for sleeping, then put up at night to clear the space for entertaining. Build drawers or shelves into the walls to store your clothing and keep them out of sight. Other storage beds like trundles can also be used to save space. Even if you want to have a dedicated bedroom space, you can use a wall bed or storage bed to make the most use of the space. Instead of a big bed sitting in the middle of the room all day, you can fold it up and clear a big area. By using other space saving furniture like fold-up chairs and tables, you can easily set up an office or sitting area during the day. At night, these items can tuck under your bed so they don’t clutter your space. When you fold up a wall bed during the day, the underside will serve as your wall. You can add panels or molding to make it look decorative, or you can add some functionality to it. You can add a fold out table or desk, creating an office or eating space. 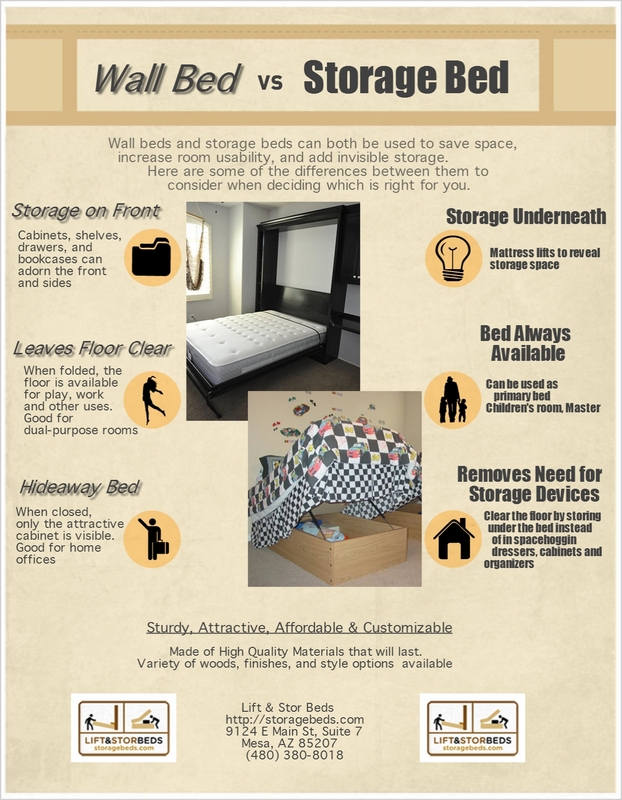 This is considered a custom addition for most wall beds, but many manufacturers are happy to add it for you. Whether you have a tiny house or just want to make the most of the space in your traditional house, Lift & Storage Beds can create the solutions that you need. Our storage beds are also able to be customized to fit your décor so you can create a look you will love. Between our storage beds and other space saving furniture, you can create décor that expresses your personal style while also helping you to maximize your space, no matter how big your home.